Why it’s important to take baby steps when it comes to trying new things. How you never know where you’re going to get insight that will change your life. How blogging can help you share your story and grow your business. Why it’s important to shift your thinking about trying new things. The importance of starting small when you build new adventure habits. How asking yourself “why” you’re afraid of trying new things can help you build confidence. How getting involved with Burning Man can be fulfilling in adventurous ways. This week’s episode features an interview in the Getting Real with Women in the Middle Mini-series that introduces you to a real life woman who has has made a big change and figured out how to love her midlife. 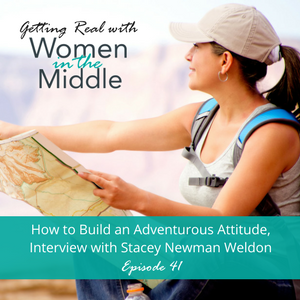 Stacey Newman Weldon went from being an award-winning corporate sales director at major magazine brands to being an entrepreneur who focuses on helping women be more adventurous. Stacey’s road to adventure was not a smoothe one. She ended her marriage and got involved in several co-dependent relationships. Stacey hit a relationship-rock-bottom and had to discover what she calls, “emotional sobriety.” She realized that SHE was the problem and was committed to climbing out of this hole. Stacey “felt like she would do anything to help herself feel better” and found insight when she least expected it. She worked hard to get help, went to Alanon, read some amazing self-help books and met with alternative “woo woo” spiritual guides including intuitives, psychics and even a channeler; she was guided to find a fear and face it. She started with small adventures and her life began to change as her mindset changed and she connected deeply with her playful attitude. 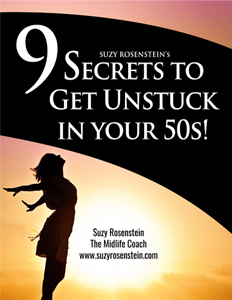 Now Stacey helps other women become more adventurous too. She believes that change doesn’t have to be hard and shifts in perspective can help. Shifting from thinking that “Life is Hard” to “Life is Fun,” combined with the commitment to take yourself on adventures big and small is the ticket to happiness.